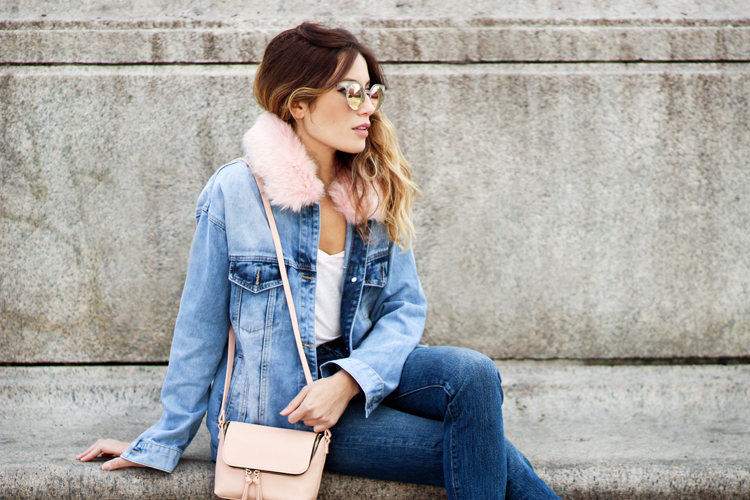 Faux Fur collar denim jacket and zip crossbody bag c/o Forever 21, Levi's wedgie-fit jeans, Quay sunglasses (similar here), Chinese Laundry Nikki mules. Shot by Isaac Lacey. Which was a little shocking to me at first, not only by the mere specifics of the name I referenced (pretty sure I got it from a marker), but because I was such a tomboy growing up... and kind of still am (if you ignore my diverse collection of heels). But that reaction in turn got me thinking: what is it about the color pink that makes it feel inherently feminine? Like anything else in life, it's a social construct. A primer for painting your nursery and buying baby clothes that we somehow still use daily. For the most part, in our society, pink = girly, feminine & naive, while blue = boyish, masculine, tough. That's some bull and you know it. So when I found this funky F21 denim jacket, I knew it had to be mine. 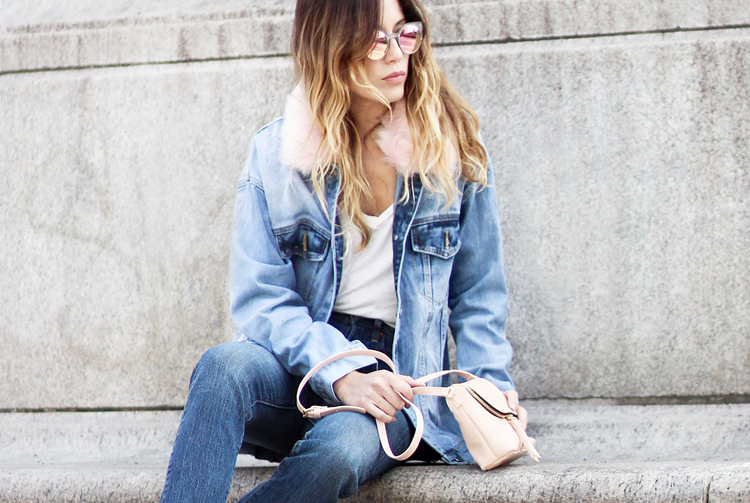 The pink fur collar adds just the right pop of color to any look, plus a fun punky vibe. I then paired the coat with a matching blush pink bag and pink reflective shades, just to really accentuate my point: Who's 'girly' now?! The touch of pink is so good! Love the denim jacket and the shoes a lot!! YESSSS! I love pink! This look is so fantastic.